People send and receive a lot of e-mail. 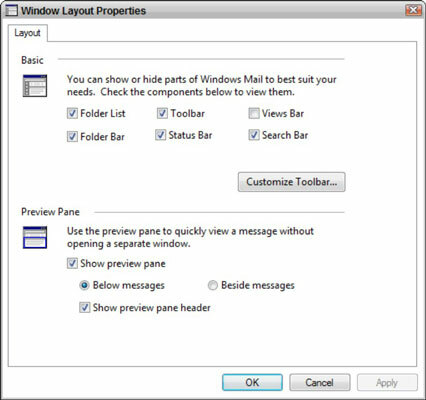 Knowing how to customize the Windows Mail layout in Windows Vista gives you the power not only to change the look of the layout, but also to determine what tools you want to keep close at hand. This control can help you set up the most efficient workspace for you. Choose View→Layout to open the Window Layout Properties dialog box. Select various check boxes in the Basic section. Folder List: A pane containing a list of all folders. Folder Bar: A bar near the top of the screen that includes a drop-down list of folders. Toolbar: The bar containing tools you use to create and work with messages, such as Create, Reply, Forward, and Print. Status Bar: The bar across the bottom of screen that lists the number of messages in all your folders and the number of unread messages. Views Bar: A bar under the toolbar containing a drop-down menu with three commands: Hide Read Messages, Hide Read or Ignored Messages, and Show All Messages. Search Bar: The bar that allows you to search your mail for keywords or other criteria. 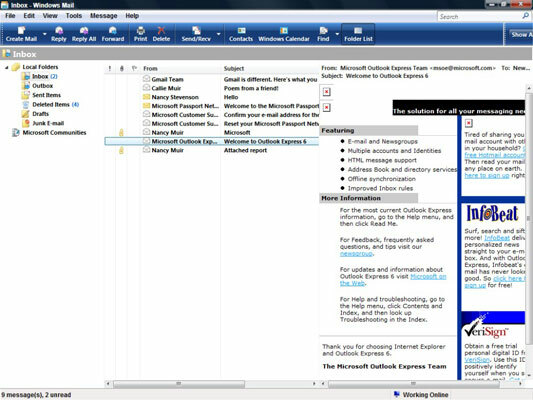 Various elements displayed in Windows Mail. Select various options in the Preview Pane section to preview a message. You can select options to display a preview of a selected message from the Inbox, Outbox, Drafts, Sent Items, or Deleted Items folders. Click OK to apply and save all your layout settings.